For today I was going to write about the latest developments in taking on college & university "Disability Services" offices. This post is written during what is being tweeted as the Baltimore Uprising. A couple weeks ago a man named Freddie Gray was killed brutally while in police custody. Baltimore is literally on fire, people are--if we're being honest, and I always am--risking their lives protesting police brutality, and activists in cities across the nation are protesting in solidarity with Baltimore. 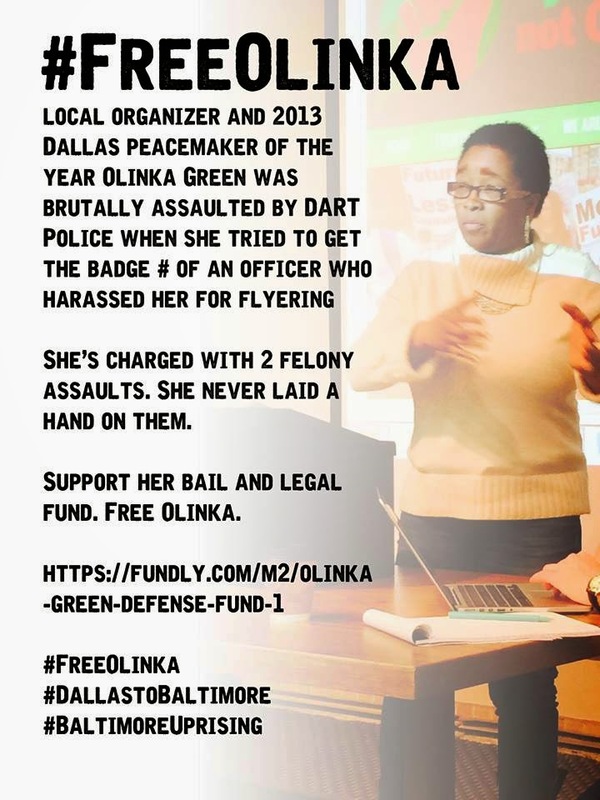 Because I am a tell one story at a time kind of person, the bulk of this post is going to be about an activist in Texas, Olinka Green, who is a disabled Woman of Color & a friend of a friend. Olinka was at a silent march in Dallas, wearing a sandwich board with names of people killed by police. She was told to leave by some of their 'law enforcement' officers, and she did. Then she attempted to get the badge number of the officers making her leave, something that is well within her rights to do (as is standing in a public place with a sign, but we know that). An officer ran her down with a Segway and maced her while yelling to "stop hitting me" (the officer). Olinka was holding onto a fence at this time, trying to not fall down, and not hitting anyone. She was taken to the hospital and is now being held at $30,000 bail (yes, 4 zeros. More than many people live on in a year) on charges of "felony assault". Oh, did I mention that Olinka is disabled? I did! She has nerve damage that was certainly not improved by being run over with a Segway. She requires medication in order to not be in "cannot walk" pain. They are denying her said medication because of course they are. So here we have police brutality, racism, ableism, and likely a bit of misogyny as well all coming together. Denying people medication as punishment for going to a protest is not a new tactic. Just a month ago a man had multiple seizures while in police custody--after telling them he has epilepsy. He even had his meds with him (and was not charged with any crimes). Multiple people in our communities do not feel safe doing political activism because of this well known tactic. First amendment rights apply to everyone, not just the healthy, wealthy, and white. The solution here is not compliance, it is not "well stay in your house then". It's systemic change. Black people, disabled people, and especially Black disabled people are at tremendous risk from folks who are supposed to "protect and serve" until that happens. So. Seriously. If you can donate or share, that'd be rad. They're called rights for a reason.